The below journal entry was written in 2001 sometime after becoming mostly bedbound and unable to speak above a whisper. I had lost so much, and had no real means by which to communicate that loss. I was still living in my small apartment then, and at the time, could shower and heat up food on my own. However, doing so took every single tiny morsel of energy I had and rendered me otherwise bedridden. I had no real computer access, as I could not read or sit up at the computer long enough to write mail (I did not have a laptop or portable email device yet). I couldn't talk on the phone or carry a conversation. I had not yet met my fiance. While my friends and family did what they could, geography and my own limitations in communication often left them at a distance. I was essentially alone. It was then that I started to keep a journal. 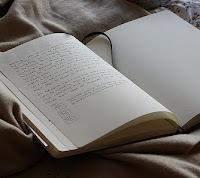 Journal writing had its own difficulties, however, as I could only hand write a few sentences at a time. Typing with one's eyes closed is one thing, attempting to write by hand with your eyes even partially closed is another. In fact, writing proved so difficult that some of my old journal entries are completely illegible. I thought I'd share one of my first (and more decipherable) entries with you today, as it expresses some of the loss, isolation and self-reflection that severe, chronic illness so often imposes on us. It also speaks to the undying, inner spirit within, and of the deep desire to have a witness to our experiences. On most days, being virtually bedridden, I often lay for hours with nothing to keep my company but my own thoughts. I have an incredible need, at times, to make sure I get these thoughts on paper. Not because I feel they are noteworthy insights at all -- in fact, usually they are fairly simple observations. It is more that getting my thoughts on paper seems to legitimate my existence somehow. It makes me feel that my time here locked up in my bedroom for months on end is not entirely wasted, and that, someday when I am well, I will be able to look back and see what was going through my mind while I spent week after week in solitary confinement. Perhaps someday I will read this journal, written in the darkest time of my life, and remember never to take anything for granted again. Perhaps, too, it will serve as a reminder that, even in the worst of times, hope can still endure and there is always something for which to be grateful. I think, of course, that I also need some form of communication... some way to tell my story, to explain my experience, and to process it all so as to better understand myself and what is happening to me. Having virtually no contact with the outside world, this journal is now my only real outlet. Cut off from others, I also feel that others are cut off from me. No one knows my daily thoughts, my current hopes and dreams, my joys and sorrows of each day. No one knows the enormous amount of strength and determination it takes for me to get through each moment of this illness. Thus, in this way, I feel twice made invisible, not just by the decline of the body itself, but by the subsequent inability to express myself. The hope is not just for the healing of the body, but for an emphatic understanding. To be seen. To be known. ...Shaken, left without any way to articulate the nightmare, and therefore isolated not only by bodily trauma, but by its incommunicability, I have felt an overriding desire for recognition. In my case, I think I'm searching for recognition not just from others, but from myself as well. I think it is impossible to suffer a serious illness without seeking deeper meaning and trying to understand who you truly are, and why you are here. Despite the multitude of limitations this illness has thrust upon me, I do feel the core of me still remains. Having been stripped of almost all attachments and all the things I once thought defined me, I am often struck by that indestructible sense of "being-ness" inside me that I still recognize as myself. In fact, I see it with more clarity than I ever did before. In losing the healthy body I had always depended upon, the center within me seems to want to emerge more profoundly than ever before. I have such respect for that part of myself, and that part in all others as well, that shines from within. ....There remained of her only a minute fiercely burning particle of being that knew itself alone, that relied upon nothing beyond itself for its strength; not susceptible to any appeal or inducement, being itself composed entirely of one single motive, the stubborn will to live. This fiery motionless particle set itself unaided to resist destruction, to survive and to be in its own madness of being, motiveless and planless beyond that one essential end. "Trust me," the hard unwinking angry point of light said. "Trust me. I stay." What that inner light, that will, or that undying and untouchable sense of "me-ness" actually is, I don't know. But I silently thank God every single day for its presence. I have so many more thoughts I'd like to express right now, but so little energy to say it. And yet, such is how it is. I have no choice but to do what I can with what I have. It's all anyone can do. Recognition and Reflection was originally published in Life Skills Magazine, 5th edition (June 2010). It is being reposted here with permission of LSM. If you would like to receive a free copy of Life Skills Magazine, you can sign up here. Please also check out Discovering Purpose, a blog about creating a purpose-driven life. Isn't it interesting to go back to a previous time in our lives and see what we were thinking at the time? I don't have many of my journals, having thrown them away for various reasons. I wish now that I could see what I was going through before my bipolar and fibro were diagnosed. I am currently going through my mother's treatment for metastatic cancer and have started writing about this journey every night. I think I will want it sometime in the not too distant future to always keep her with me. Isn't it amazing that we are able to get our thoughts out to so many people now that we have laptops and iPads? The computer age has allowed those of us with chronic illnesses to be part of a social community, which I find so helpful, since I do not have a large support system in a physical sense. yes, really all we can do is work with what we have. A agree. So beautifully articulated. I was wondering how you were doing these days? Strangely, just recently, I came across my own journals from 2002, the year I got ill. It's interesting to step into the shoe's of that earlier version of ourselves isn't it? When I read your posts, I read them slowly so as to absorb every word. So many thoughts are coming to mind; Gratitude about how no matter what, deep down inside us Joy and Peace always reside. That because of forced stillness we are able to tap into deeper spiritual truthes. And about how maybe one reason my own CFS isn't worse is because I also have the great challenges of addiction brain disorder, and mild/moderate borderline personality disorder to contend with. But all of these make me a better person because through severe suffering can come greater compassion. Laurel, I think that is one of the aspects of severe illness that only people who have been there can truly understand. I, too, have found this very stubborn and extremely strong part of me that just keeps on "wanting to exist". The more that gets taken away from us, the more it comes to life. I have found this both incredibly beautiful and at times scary. Personally, I never knew how much I defined myself through external judges, and it's still though at times to figure out who I am when I can't be defined by what I do or by how others see me. But that brings with it a strong motivation to make sure what is left is beautiful, true and honest - and not corrupted by horrible experiences. Something that I keep learning from you. You describe the desire to be here...to matter....to light up our corner of the world so very well. Beautiful post, Laurel..thanks for sharing it with us..